Hey hey! Scraplift Sunday is on the Paper Issues blog! 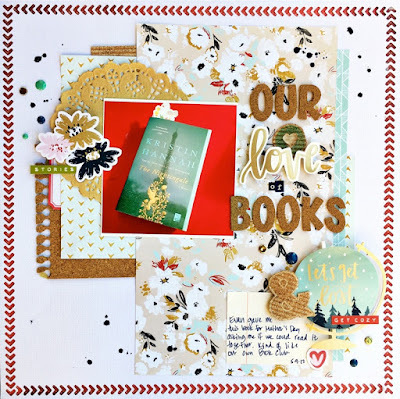 Today we are lifting Michelle's layout for the Notable Quotable challenge. Yep, Shimelle Glitter Girl again! I cant stop! 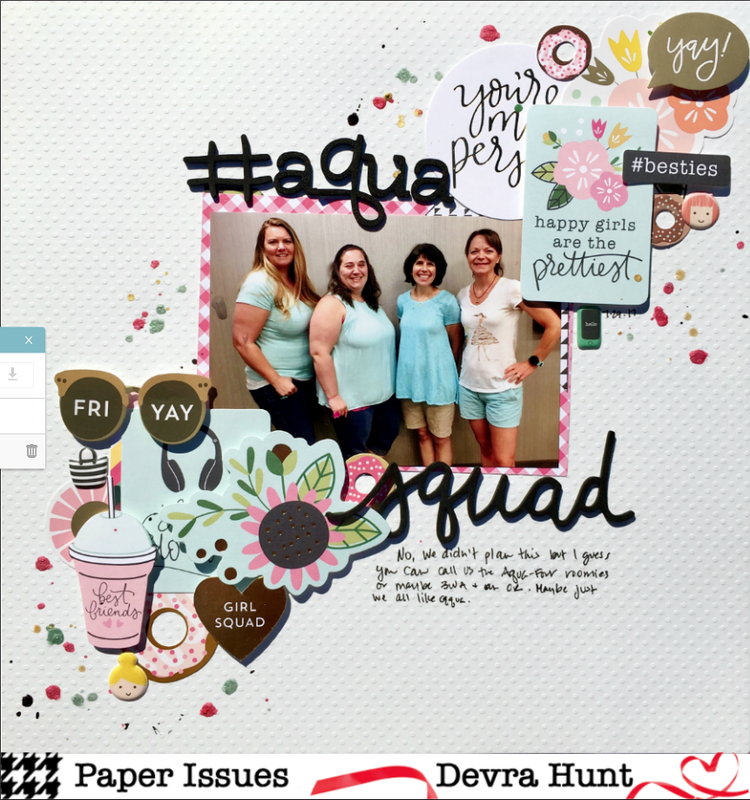 Pink, and turquoise and happy silliness to my heart's content! I hardly changed anything from the original design. Different sized photos and some extra embellishments. More photos from my birthday. One of my friends walked in and threw something around my neck, grabbed my wineglass and all of a sudden I had free hands. She said she was bored the night before and started knitting. Next thing she knew she's made me a wineglass holder! Genius I say! Thanks so much for stopping by my creative view today. Come back gain soon, I have more to share. If you can't tell by now this is Shimelle Glitter Girl my favorite, favorite collection, You can get it for 20% off using DEVRA at checkout. Hey hey we made it to Friday! 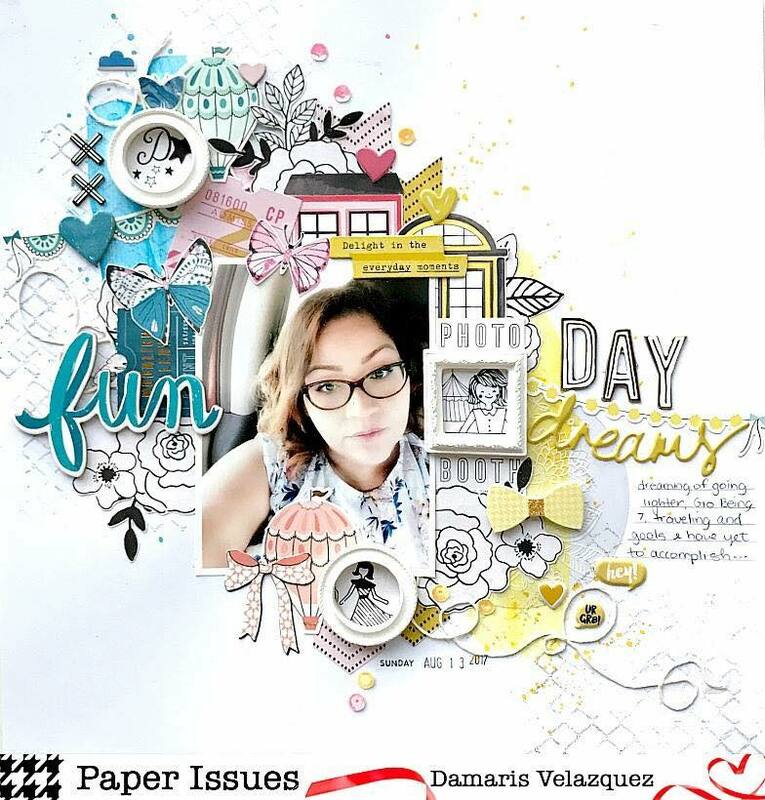 It's not just Friday though, It's Free File Friday at Paper Issues. Today's theme is to use our cut files on your Fall or Halloween projects. While trying to decide what I wanted too do, I came across this photo. Bam! Decision made. The title was pretty much hand picked for me. All I did was make it larger and place it vertically on my page. That's the cool thing about cut files. They don't have to be elaborate to be effective. 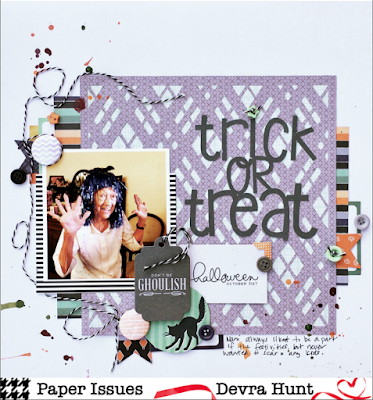 Fancy Pants Spellbound is my Halloween paper of choice this year. The colors are so different form any Halloween collection I've used before. I love it. Every year, since he began Trick or Treating, my son would come home, dump his bag of candy on the floor, sort it, then count each pile. The fun part was, when he was little we could take what we wanted and tell him it was icky. As he got older he was more aware of what kinds of candy he had. Thanks so much for stopping by my creative view today. I appreciate you being here and hope you'll come back again soon. I always have something to share. Hey there! 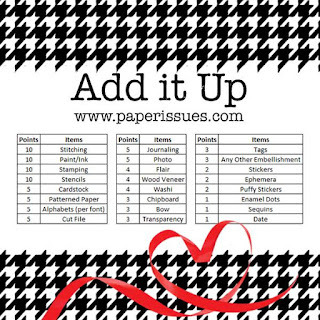 The new Add It Up challenge is on the Paper Issues blog today. This is such a great challenge. Each month we have two stay within or reach a certain mount of points, given to us. Points are achieved based on the chart below. This month we had to stay under 50 points! Well, I thought this would be easier than it was. But I did it at exactly 50 points. I used one piece of the Shimelle Glitter Girl paper. called Be a Square one photo and a couple of stickers. It's supposing how quickly things add up! You will be seeing so much more of this from me. I'm doing a whole series of photos with this collection. I love everything about it. Yep, more photos from my birthday. My sister made me put on the crown and sash. I said one photo only. Then I took it off and put it away. Thanks so much for stopping by my creative view today. I have a bunch of stuff up my sleeve, so come back again soon. You can still get Glitter Girl in the Paper Issues shop. Get it for 20% off using DEVRA at checkout! Hey Hey! Happy Sunday. 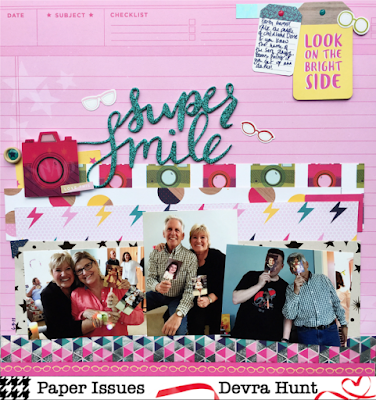 Make that happy Scraplift Sunday! Today at Paper Issues we are lifting this little number Becky created for our current Issue 'Witch Kraft'. I'll take ant excuse to use multiple photos on a page. And right now, I'll take nay excuse to use Shimelle Glitter Girl. As soon as I saw photos of this collection, I knew I wanted to use it for the photos from my birthday party. 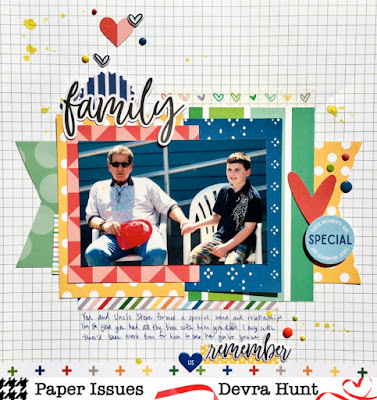 So many fun layers on this page means opportunities to use many pretty patterned papers! I grabbed 3 smaller photos, in different orientation. Other than that, I didn't change much. I started with the Dream Big paper for the background. Because Pink! 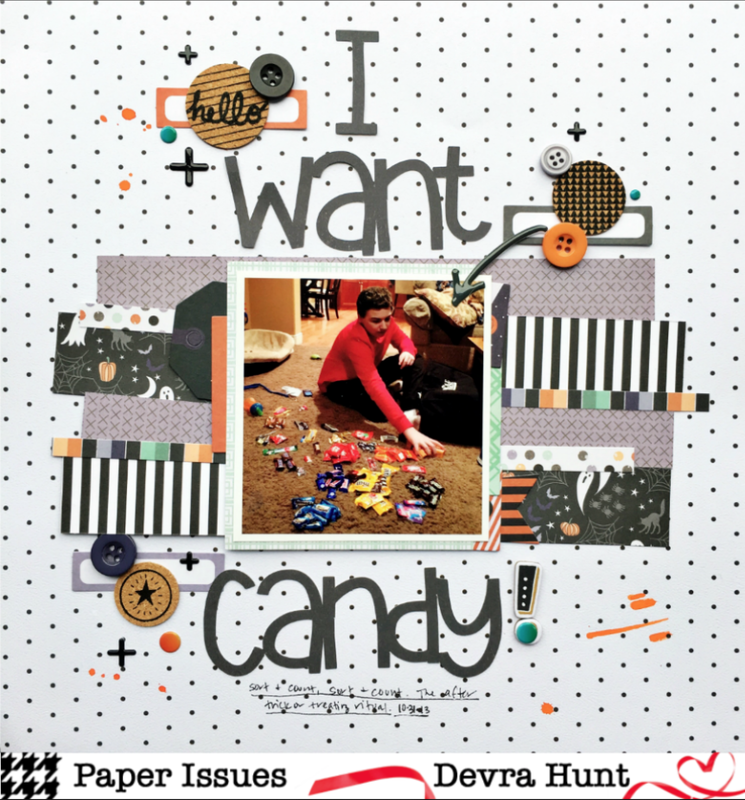 I layered us a few others, slapped on some die cuts, stickers and the Sparkle Phrase Thickers, and it was finished. Thanks so much for starting your week off with me at my creative view. Come back again soon. I have more to share. Believe me when I say Glitter Girl is ah-mazing. It's itchy, cheeky and makes me smile. Get it. now. It's 20 % off with DEVRA at checkout! Hey hey we made it to Friday! Free File Friday that is! Paper Issues has over 100 cut files in the shop and they are all FREE! 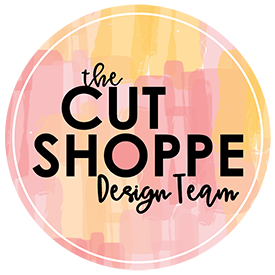 Today we are focusing on all the cut files that have leaves on them. My layout today all revolved around the leaves. But I didnt have a photo I wanted to use. So I took one! I searched through all the files and landed on the Better Together bouquet. The best part was Welcome Home by Carta Bella arrived in the shop, then quickly into my hot little hands! 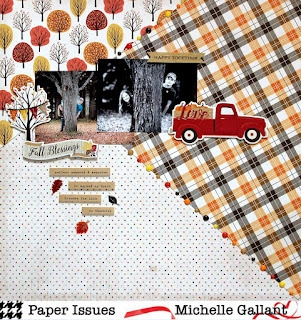 Now, I have to say, this is not really what I consider my style of paper collections, but there are some wonderful family sentiments, small patterns, and gorgeous florals, including Gather Flowers, which I used behind the cut file. 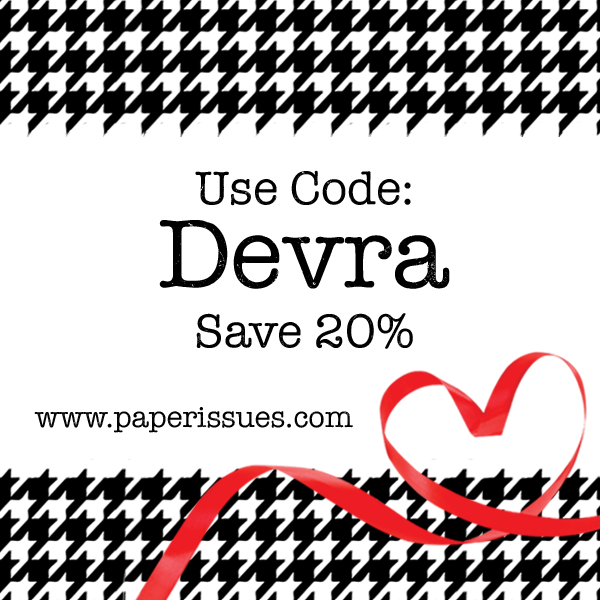 The page is really very simple, revolving around the cut file. I only added a few pieces of chipboard and tags. It didn't need anything else. My son gave me this plant for Mother's Day. I do not have a green thumb. I don't even try. Plants are not my thing. I have no idea how often I'm supposed to water it, when it needs transplanting, or if its an indoor or outdoor plant. Somehow, it has not only survived but grown and flowered multiple times. Thanks so much for being with me all week. I'm not done yet so come back again soon. Hey there! Back again today with a project for the Notable Quotable challenge. This quote put me right in the fall mood. Out leaves aren't crunchy yet, and it's just cooling down now, but fall also means apple season around here. 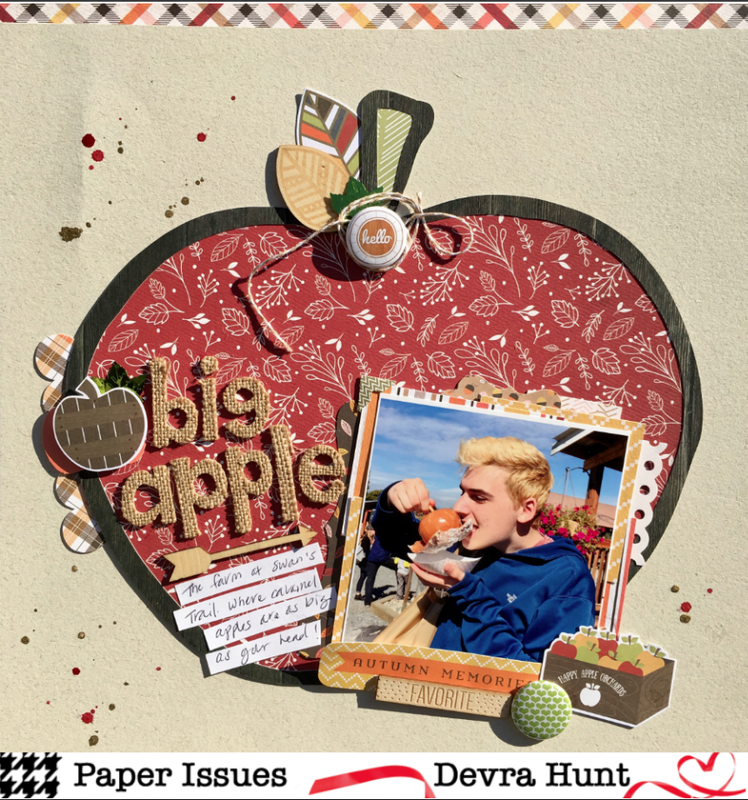 I started with the apple from the Take Note cut file and enlarged it. You know, to play on my title. I filled the apple with the Carta Bella Hello Fall paper, also tucking and layering more under my photo. 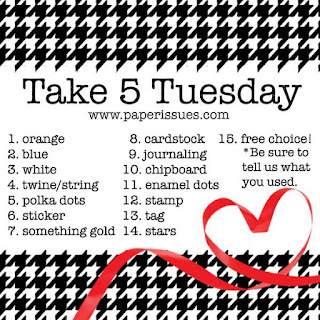 I love the Frames & Tags ephemera for adding bits of pattern . 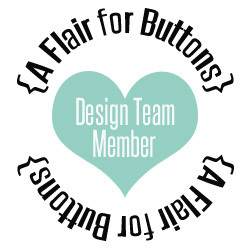 I added lots more bits including some of my favorite flair from A Flair for Buttons. and called it done. So like I said, it's just cooling down the trees are changing color, but its definitely apple season here. Living in the state that produces the most apples gives us plenty of orchards to visit. After we pick our apples, we always visit the the rest of the farm, including the bakeries. Who knew the Caramel Apples would be so big? Thanks so much for stopping y my creative view today. Come back again tomorrow, I have more up my sleeve! I have never cut into new papers so quickly. 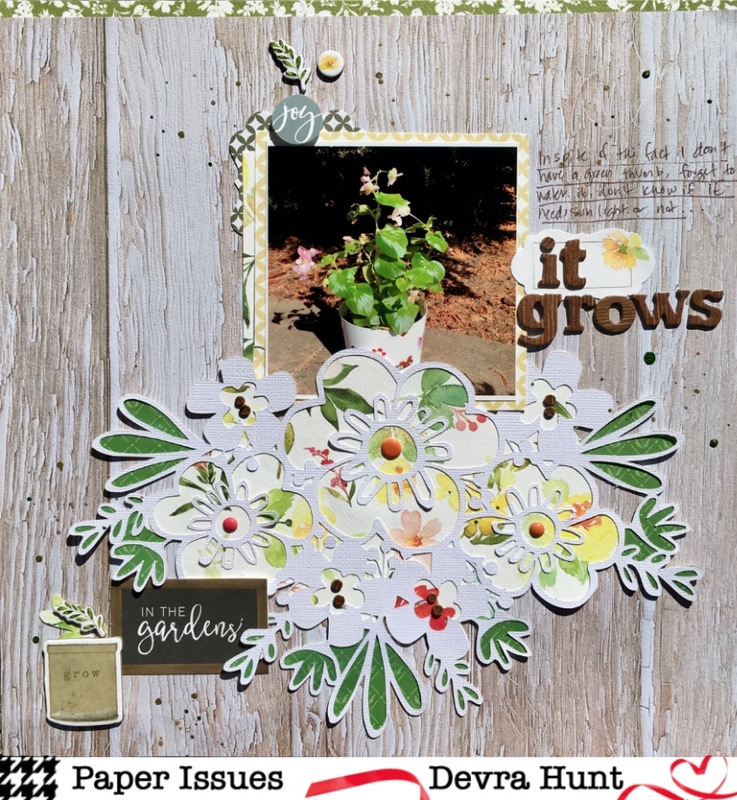 It all started with the Hello Sunshine piece from the Magical Phrase Chipboard Thickers from the new Dear Lizzy Star Gazer collection. I also couldn't wait to use the Color/Circle Burst free cut file. Fast forward an hour or so, Ive sewn around the cut file, cut and glued 6 of the different papers, added a few die cuts and puffy stickers and voila! It's done! So every morning, I have to drag this guy out of bed. Typical teen ager right? But then he gets to the landing of the staircase, and smiles at me. He sits there for a few minutes to wake up, then I have to entice him some more to come all the way down the stairs. Some days are harder than others. That smile makes everything a little easier. Thanks so much for stopping by my creative view today. I'm not done this week, so come back again! Let me tell you, this new Dear Lizzy is truly unbelievable. Get some now before it's going for 20% off when you use DEVRA at checkout! Hello hello! It's October! Holy moly that happened fast! 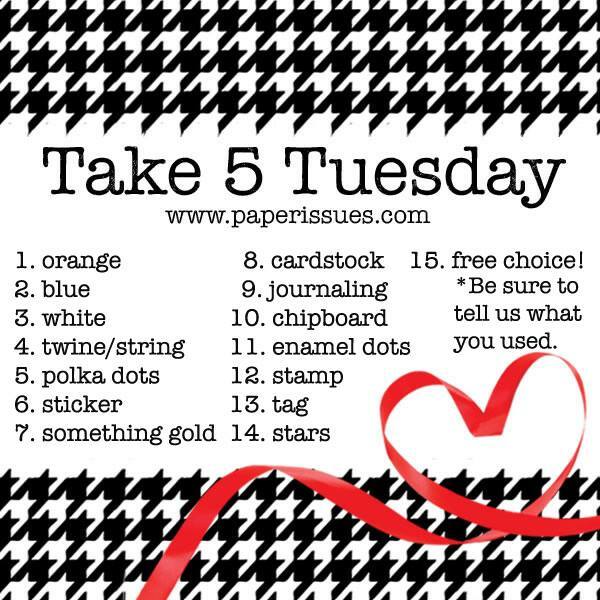 Well, that means there's a whole new month of challenges at Paper Issues beginning today! Let's start with Scraplift Sunday shall we? Today's lift is provided by Damaris. 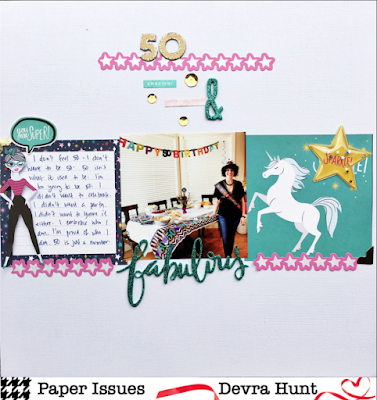 How fun is all that embellishment goodness cascading down the page! You might have guessed that I was drawn to the cascading layers of embellishments. Forget the color story int he original. That didn't matter to me. I grabbed Pebbles Girl Squad and went to town. 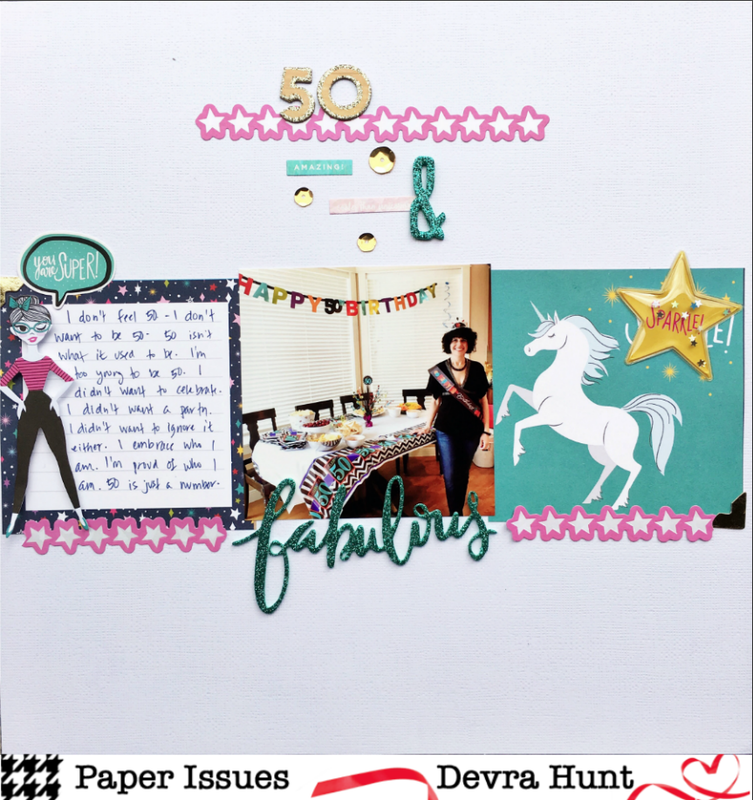 I can honestly say, this is the first time Ive ever finished a whole package of die cuts! 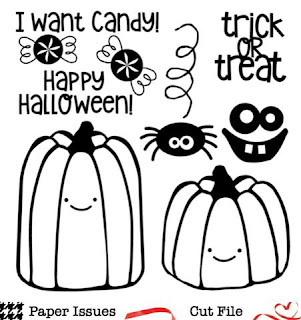 Along with them, are stickers, and puffy stickers. This was so easy and quick! These are the friends I roomed with on our annual weekend getaway. We all came downstairs dressed in the same color. We giggled a little. It was totally unplanned, but a perfect photo opportunity. Thanks so much for stopping by my creative view this fine October morning. Stay tuned. This is going to be one wild and crazy month! Supplies: CS-Bazzill, PP, stickers die cuts-Pebbles, alphas-American Crafts, mist-Heidi Swapp, Tattered Angels.